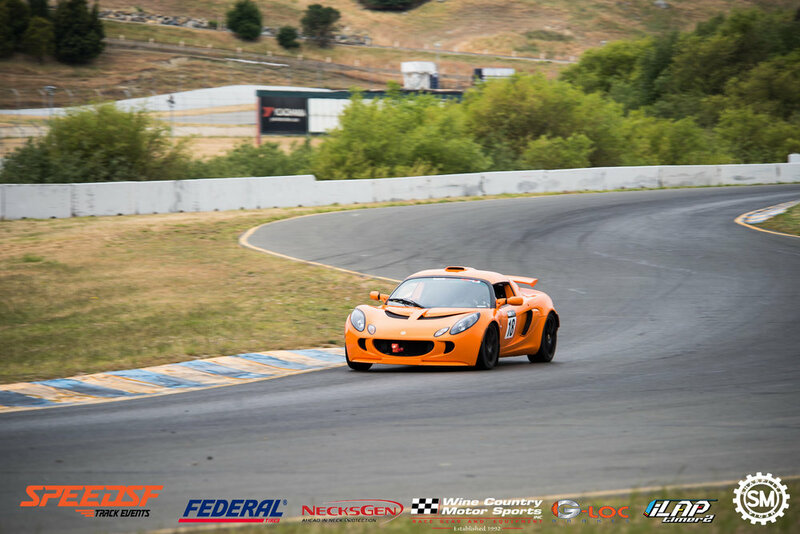 On Saturday, May 26, the Exige returned to Sonoma Raceway for the SpeedSF Challenge time attack event in the "S2" class. The competition in this class includes cars such as the Porsche Cayman GT4, Chevy Corvette (C5 Z06 and C6 Z51), and highly modified Hondas and Subarus. This was the first outing with several changes to the Exige performed by Trackspec intended to help it be more competitive without compromising the ability to drive it on the street with a full interior and air conditioning. First, the Nitron single-adjustable coilovers were replaced by BWR Penske double-adjustable units. Along with the coilovers, monoball bushings, upgraded toe links, a rear toe brace, and engine mounts from InoKinetic were installed. The worn Toyo Proxes R888R were swapped for Bridgestone Potenza RE-71R's on stock wheels. Finally, the vehicle received BOE's power recipe and Torque 300 tune. Sonoma is the most technical track in the area with few straights and several connected, "compromise" corners. The first session at this track is always eye-opening, let alone the first session with a dramatically changed setup. Pulling into the garage after the first session, I found the tires had 34-35 psi hot after starting at about 26 psi. I bled them down to 32 psi and walked to the classroom to check times. Staring at the timesheet, I saw a 1:51.8 on the board. This time was initially disappointing because it was barely an improvement from the previous 1:52.1 set with stock power and Nitrons. The prior record holder in the S2 class set a lap of 1:49.5 earlier in the morning. The 2.3 seconds between his time and mine seemed like an eternity to make up. After contemplating for a few minutes, I decided that I shouldn't expect to immediately go set a better time just because there were better parts on the car. I had to re-learn how to drive the car to maximize the benefit of the upgrades. In the second session, the changed balance of the car started to become more intuitive. The BWR Penske's add a significant amount of front grip and make the car more sensitive to drive. Also, the RE-71R's reach their operating temperature very quickly, but they can overheat and lose grip if driven too aggressively. Smoother steering inputs and patience with the throttle helped improve the time to 1:50.4. In the "Challenge" session, several factors aligned. The Exige caught a draft on the outlap from a Camaro ZL1 1LE and a draft to the finish line from an S2000, setting a time of 1:49.4 and winning the S2 class. I'm excited to continue learning how to drive and adjust this new setup. The S2 class record at Sonoma is 1:48.6. I'm confident that we can eclipse that time with more practice and tuning. The Exige is an inspiring car to drive and the Trackspec team and Lotus community have made the journey very rewarding thus far. The next time attack is at Laguna Seca on June 17th. Older PostPodium Finish and a new PB!